Mumbai : The special occasion of the Eid has been beneficial once again for the 'Dabangg' star Salman Khan as his latest offering "Bajrangi Bhaijaan" movie, which was much awaited by the fans, has been getting brilliant response has amassed Rs.36.50 crores on day two. 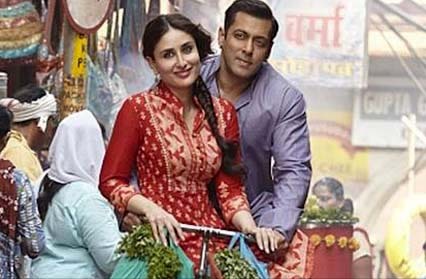 'Bajrangi Bhaijaan' was released on Friday July 17th, the film witnessed a big hike at the domestic box office on the festive day. After garnering appreciation from the film fraternity, who called 'Bajrangi Bhaijaan' Salman's 'best film ever' is roaring at the Box Office. According to a leading trade analyst, the movie collected Rs.27.25 crores on its opening day and took off in a big way on the Eid, taking its total collection to Rs.63.75 crores. 'Bajrangi Bhaijaan' also stars Kareena Kapoor Khan and Nawazuddin Siddiqui, narrates the story of a Hindu man on a mission to take a Pakistani girl, who is dumb and mute, back to her country. It chronicles his adventures and experiences faced during his road trip. Kabir Khan directorial film, which was released on more than 5,000 screens across 50 countries, including the US, Britain, Pakistan, New Zealand and Australia, is making a mark overseas as well.